On the last Sunday in September, Iñaki Extebeste, who Claire and I had met at the recent IUFRO conference in Banff, Alberta, Canada, picked me up in the morning. After a detour back to Arrasate aka Mondragon (attention Uprising Breads and CRS Workers’ Co-op alumnae!) to collect his partner Amaia Pavon, we headed deeper south in Basque Country to Arantzazu where there is a monastery, basilica, conference centre and hostel. 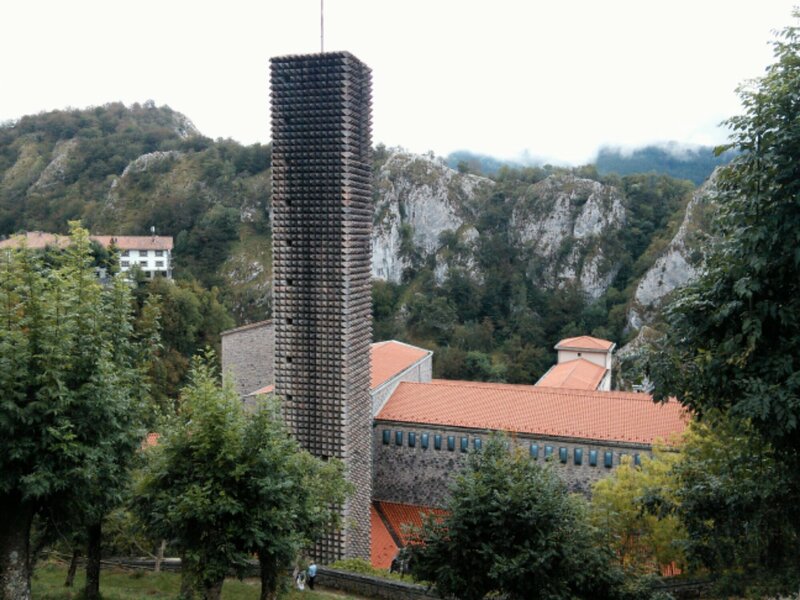 They explained that this site has been very important in the history of Basque culture. For one thing, it was a safe place to meet. And if I understood correclty, it fostered a renaissance of art, language and identity. Think of Solentiname in Nicaragua. 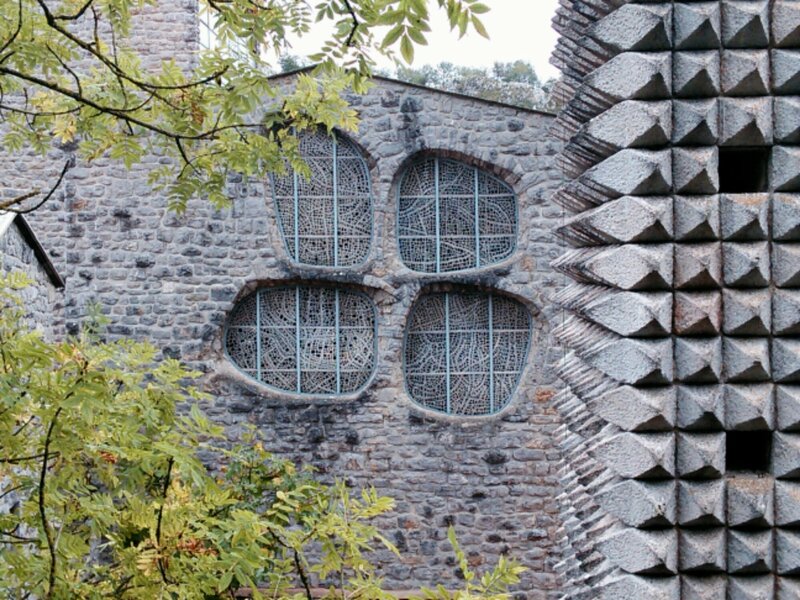 The combination of architecture, sculptures, murals, and paintings with the location on a precipice in a wooded, mountainous valley, creates a powerful impression. I found myself thinking of my late father-in-law, Zeljko Kujundzic. His kind of place. The Misterioa is a unique feature uphill from the basilica. 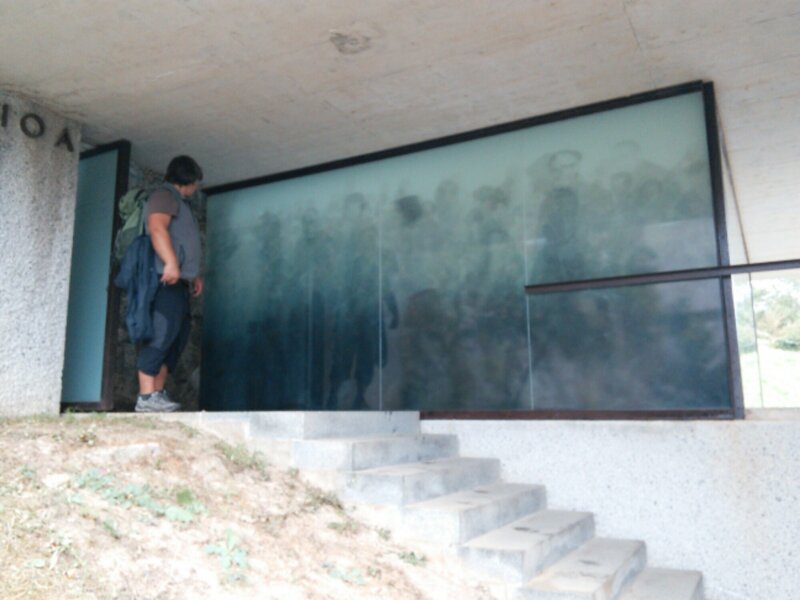 Outside and inside are paintings of saints, heroes and martyrs, including Mandela, Gandhi and King. It takes effort to recognize them, because they’re painted on the back surface of glass in a gauzy manner. Reflection and mediation are required. 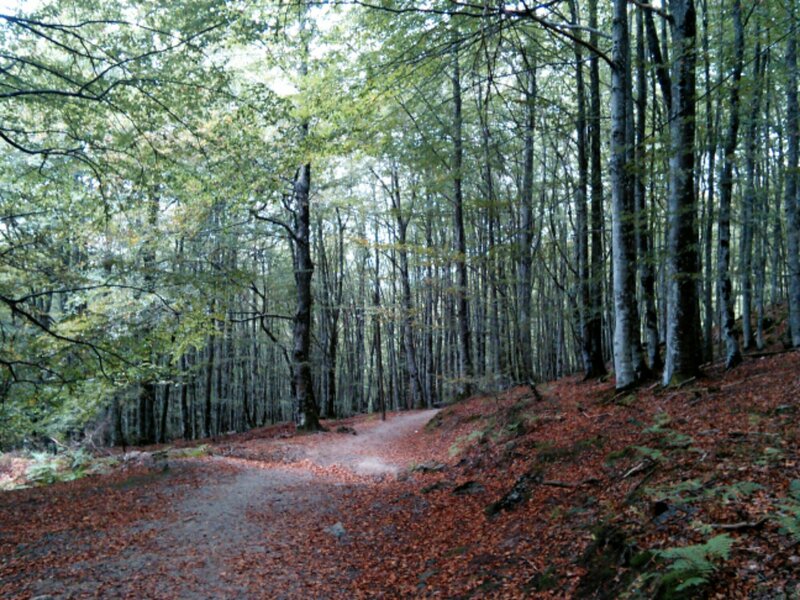 We headed up past the site on a trail many hikers were descending, then we veered off into the woods to take a roundabout loop. Beautiful, and of course, very enjoyable to have the opportunity to walk among trees with a forest scientist! 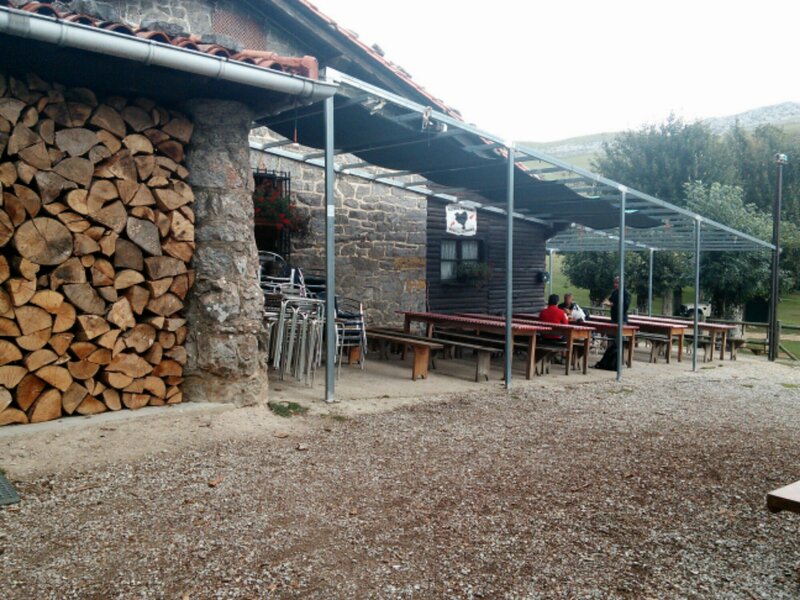 Eventually we arrived at a saddle in the mountains at the top where there’s a cider house/bar/restaurant. Iñaki & Amaia got us drinks and we sat down at a picnic table outside to share our various goodies. They had brought a delicious assortment of food, including; grilled peppers! What a wonderful lunch. 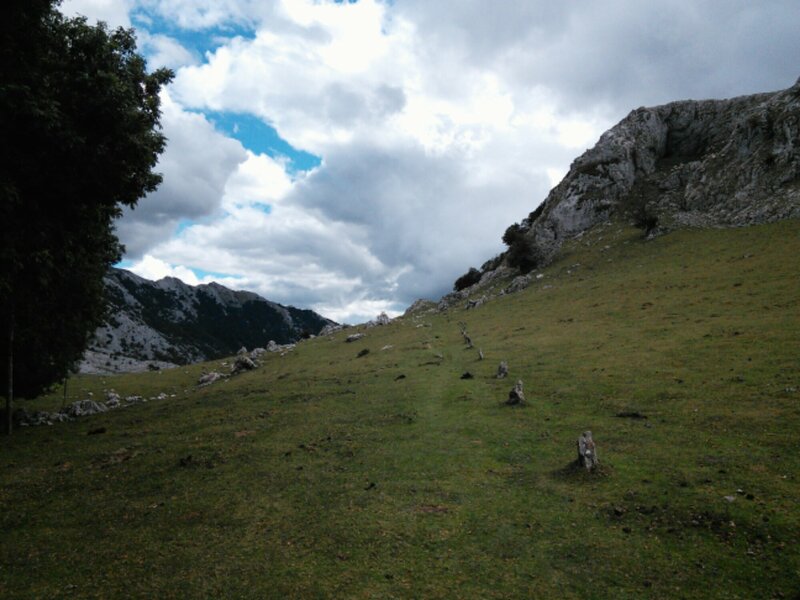 They kindly drove me all the way back to Zuloaga Txiki before heading home themselves – a lot of driving. 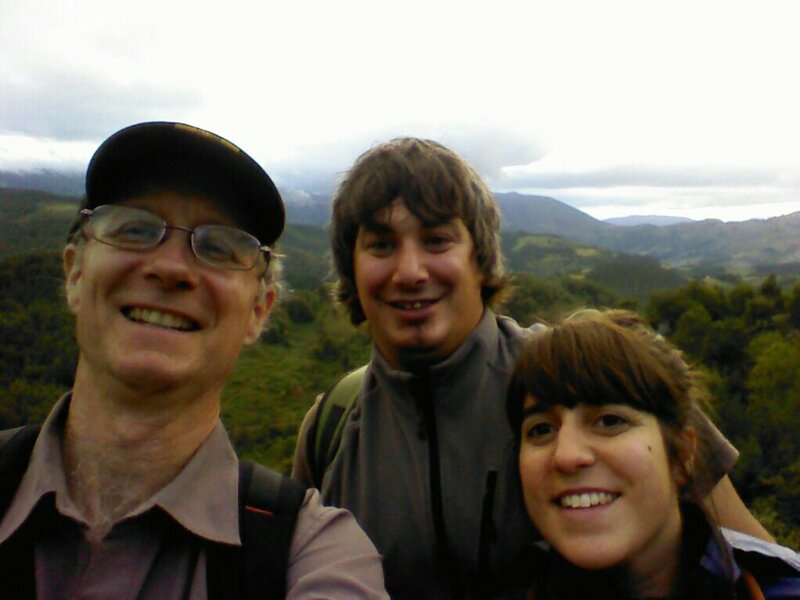 I am very grateful to Iñaki and Amaia for deepening my introduction to Basque culture. 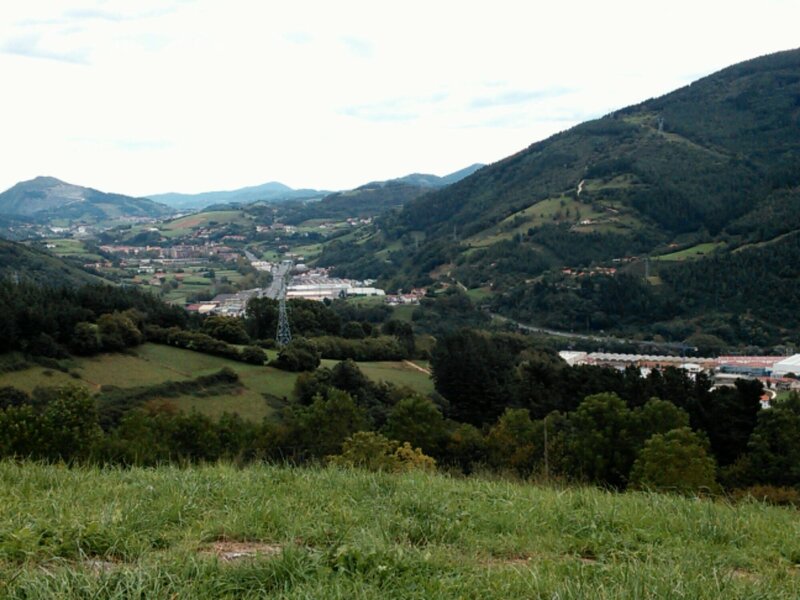 This entry was posted in Euskal Herria, Spain and tagged apprenticeship, art, paper, Spain on October 19, 2013 by Bill Horne. On Saturday I walked in to the market. A man I bought cheese from last year recognized me and the general scene was even more lively than it was last year. 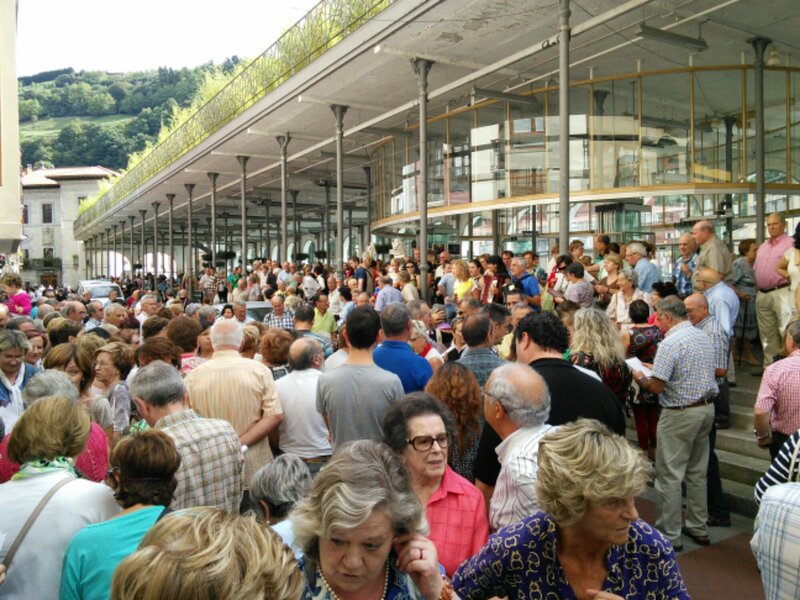 There was an eco-fair, an African fair trade booth, and the Tolosa choral group was out in force, with traditional Basque musicians alternating reed/drum instrumentals with their songs; fantastic to hear so many people singing, let alone in Euskara – Basque. 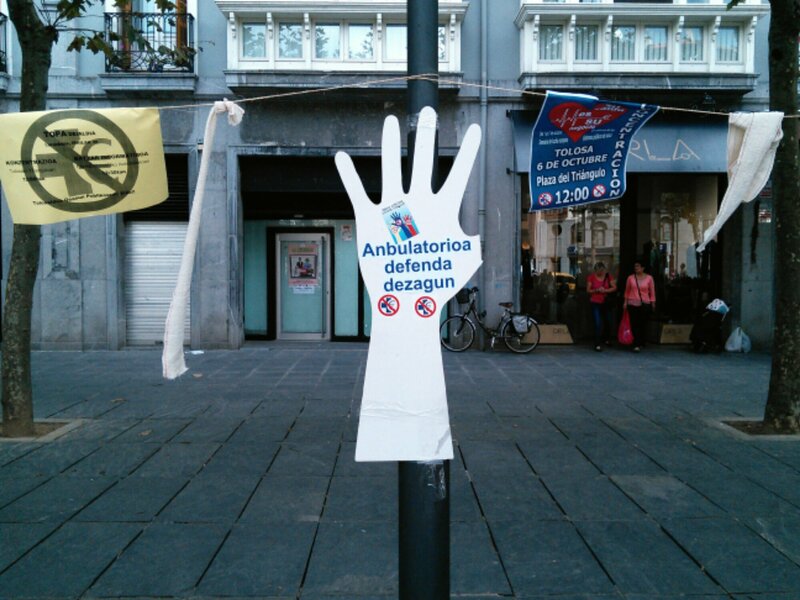 Like last year, there was a protest in the triangular plaza against health care cuts. After chatting with some of them, I helped dismantle their banners and haul a wheel chair with a mannequin in it up a couple of flights of stairs, then bought a colourful shirt from the group to donate to the CCPA’s annual fundraising auction. 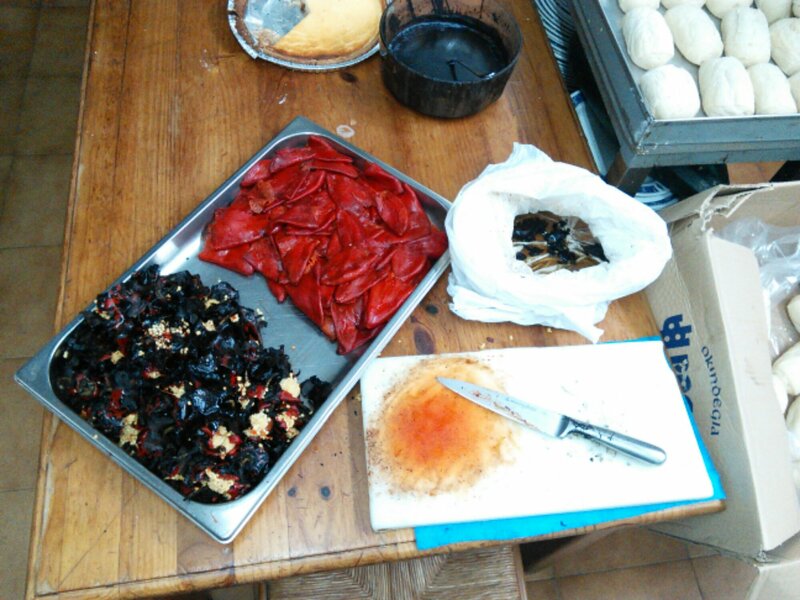 Around the corner I found Luisan roasting pimiento peppers while his friend Antton handled sales. Their minimum bag weighed several kilos, but I managed to persuade some young British English teachers to share one. I wish I had given them more – it took me 3 hours to peel & de-vein/de-seed the batch I gave to the kitchen at the hostel where I’m staying 😮 Very tasty, though! Found a shoe repair shop so I ran back to the hostel for my walking shoes, one of which had blown out and was at risk of falling apart. 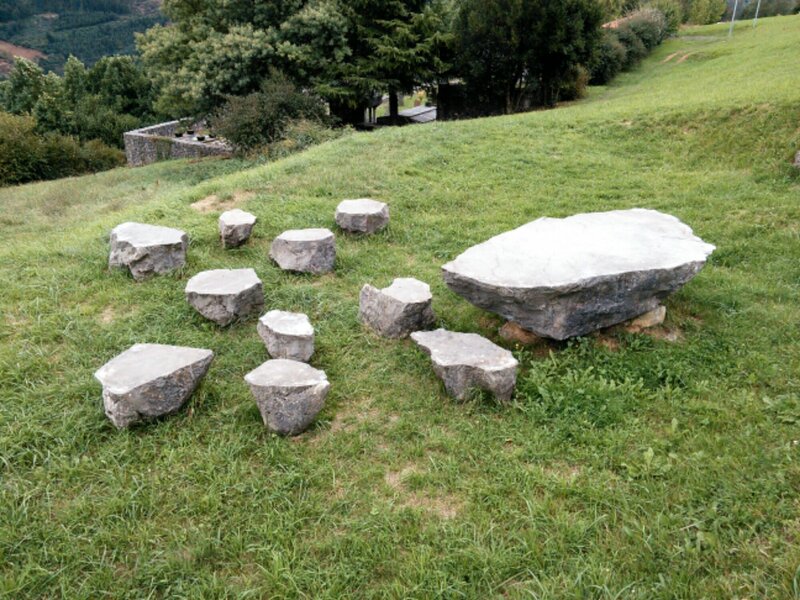 It was too late to catch a guided tour of the TOPIC puppet museum, so I headed back to the hostel & up the narrow 3 km switchback road to Hernialde for a picnic at a lovely viewpoint with stone seats. 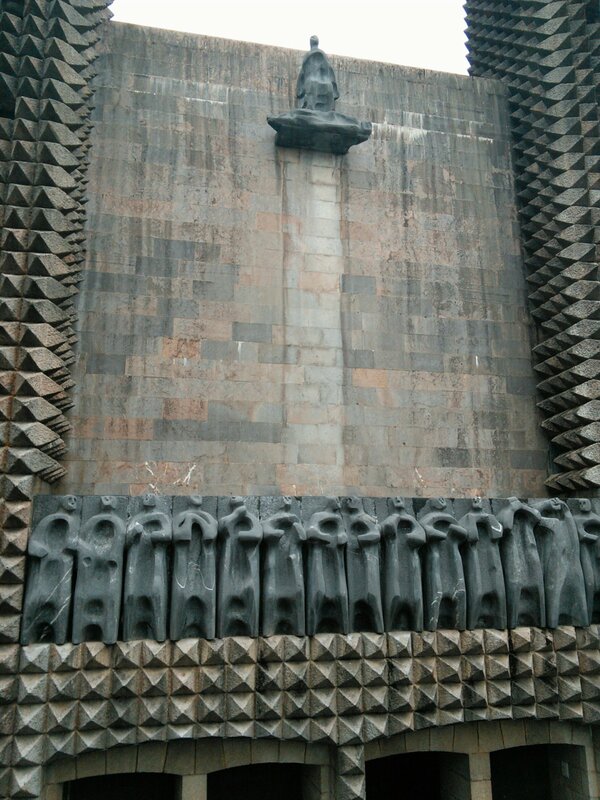 The woman at Ostatua Hernialde remembered me from last year, too. At times I feel like the Gadjo Dilo – Crazy Stranger – in the Tony Gatlif film! 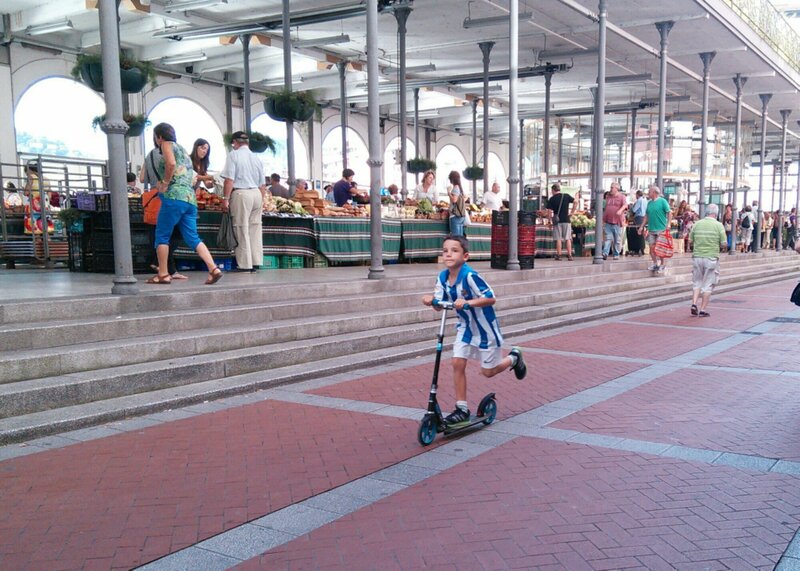 This entry was posted in Euskal Herria, Spain and tagged Basque culture, Hernialde, market, Tolosa on October 1, 2013 by Bill Horne.